1. In a small saucepan of salted boiling water, cook the lima beans until tender, about 10 minutes. Drain the beans and rinse under cold water. 2. In a large bowl, whisk the lime zest and juice with the olive oil, scallion, jalapeño and shallot; season the dressing with salt. 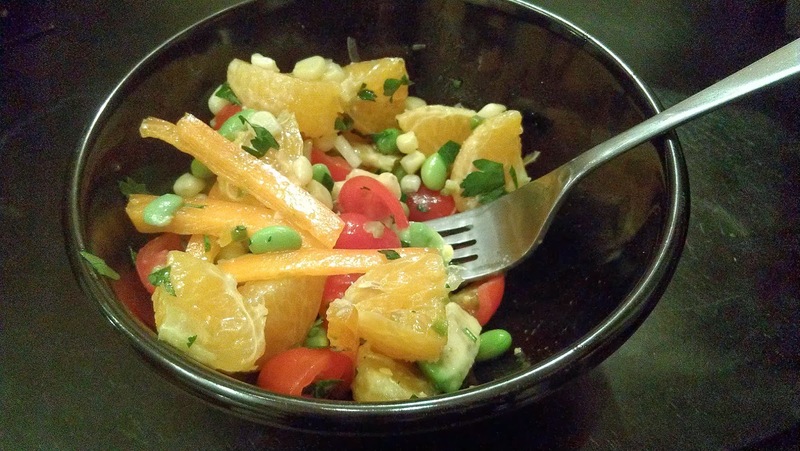 Gently fold in the lima beans, corn, nectarines, avocado, orange pepper and tomatoes. Refrigerate the “ceviche” for at least 2 hours. Fold in the cilantro just before serving and serve the “ceviche” chilled. MAKE AHEAD The salad can be refrigerated for up to 8 hours and eaten over the course of a week! 1. Preheat oven to 350°. Trim beet stems to 1 inch; gently wash beets, and place in an 8-inch square pan. Add 1/4 cup water, and cover with aluminum foil. Bake 1 hour and 10 minutes or until tender. Uncover and cool completely (about 30 minutes). 2. Cut a 1/4-inch-thick slice from each end of grapefruit using a sharp, thin-bladed knife. Place, flat ends down, on a cutting board, and remove peel in strips, cutting from top to bottom following the curvature of fruit. Remove any remaining bitter white pith. Holding peeled grapefruit over a bowl, slice between membranes, and gently remove whole segments. Reserve 1/4 cup juice. 3. Whisk together olive oil, next 4 ingredients, and reserved 1/4 cup grapefruit juice in a bowl. 4. Peel beets, and slice into wedges. Arrange arugula on a large platter; top with grapefruit and beets. Drizzle with vinaigrette; sprinkle with pistachios. Add salt and pepper to taste. From Southern Living December 2013 Magazine.